Is really too much for me-e-e!" A clown in a dirtied, polka-dot uniform wheeled around with his hands in the air, his voice echoing throughout the cracked, long-dead field. As he sang, his feet kicked up dust and dirt, and the twigs cracked and snapped, almost, but not quite, in rhythm. 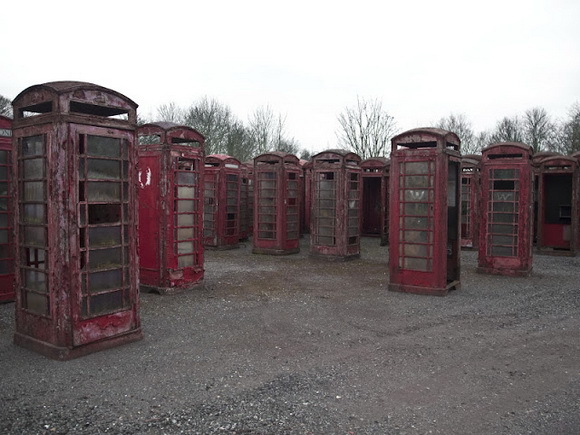 If a clown whirling and singing in an empty landscape wasn't strange enough, the red phone booths that lay strewn around in the dirt and grass only added to the peculiarity of the scene. As the clown drawled on and on, he whooped around one particular, cracked and dirtied scarlet rotary phone that lay off-kilter, as if it had fallen and crashed. Smoke curled from the defunct machine, so that with the combination of the clown and phone, the scene almost looked like a lonely bonfire dance. Can really give you an AWFUL FRIGHT!" A resounding crack and flash of light, and the single clown was gone, replaced by a ring of giant, prancing pink elephants, all linked together by the hands. As they stomped in unison, and thrashed and sounded their trunks insanely, eyes shut tight, the ground beneath them quaked, with the nearest surrounding phone booths shaking, bouncing, and in some cases, toppling from the enormous beasts. As the interconnected elephants continued tromping around in ring-around-the-rosy fashion, the "tune" that sounded from their noses grew louder, and even sounded like actual brass instruments instead of the expected animal sound. The trumpeting reached a crescendo and the amount of noise could have woken every other Clown in the Hub network had sound actually traveled from point to point. Another crack and a flash later, and the ring of pachyderms was gone, replaced by the single, dirtied clown, now eagle-sprawled on his back. Eugene stared up at the white abyss of the Hub, and let out a long, loud yell. Cant tel how long in this freekin' plase. Doesnt help Ive been pasing out. Drinking expired Clown Milk is grss. But hey, whatever keeps Pius and I goin. Whichever clown made the atmosphere/bakdrop/whatevr the heck it is wite with no way of telling time is gonna get a Hell of a earfull if when, WHEN I get back. Eugene finished another "page" of his journal, which was really an appendage extending from his left hand full of countless flat, flexible digits. His writing utensil? An elongated finger. His ink? More Clown Milk. He morosely shut his bookhand and retracted it back within his palm. He, along with Pius, were, to say the least, in poor shape. Their faces drooped and sagged, a result of them not bothering to maintain their shape-shifting powers; they could care less about how they looked when they were tired, dirty, and near starving. Mortimer the Fun-Lover, still a scarlet rotary phone lying down in the dust on wooden knees, continued to leak Milk and remain in its silent comatose state. For Eugene, at any other time, Mortimer being quiet would have been a dream come true. But right now, he was actually hoping the shape-shifting black sac of arms would pop up to life again to whisk everyone back home. Eugene turned to see Pius walking back to their "campsite". Since Mortimer's breakdown, the two Lesser Clowns had been scrounging around the Hub, searching for anything that might prove useful to help them on their way. "There are more than a hundred phones in here," Eugene said, staring at the dysfunctional Fun-Lovers lying around on the ground, "and not one of them has any juice of livelihood left in 'em." He laced his fingers and slouched into his curled position again. "No spare parts, nothing we can dismantle, nothing to recycle. We're freakin' screwed, Pius." Pius tossed Eugene a dirtied metal can. Eugene looked at the faded, scratched label. "'Emergency Clown Milk; Powdered'," he read, noticing the cheery, make-up-plastered Clown mascot saying the words in a balloony speech bubble. "'Remember Clowns, Add Water and Drink it Responsibly!'" He chuckled, half in amusement and gratitude, half in bitterness. He looked up at his partner again. "Where'd you find this?" "Broken down, antique cell phone back thataways," Pius turned and gestured towards the east side of Hub. "Two cans in the battery compartment, along with some…" He rummaged through his pockets again. "Emergency Clown Impulse Suppressant," he held up a bottle of purple pills. "You know, for anxiety and such, in case a Clown goes bonkers while waiting to be picked up." "Huh, we've been waiting for more than a little while," Eugene snorted. Pius rolled his eyes and continued. "Uh…some Herman Fuller Animal Crackers, I don't think they make noise anymore…" He tossed a crumpled red box on the ground. "Mr. Clean Clown's Digestible Soap Tablets—"
"Mine," Eugene said quickly, taking the box from Pius' hands, opening the turquoise tin, and popping one the pills in his mouth. Immediately, the scent of pine and mint filled the air as sea-green bubbles frothed from Eugene's skin, obscuring his body from head to toe, the suds rising into the air and popping with the sound of a harp. When the soap had all risen off, Eugene reemerged, looking much more relaxed and cleaner than he had before. "Oh, that's so much better," he breather, inhaling through his nose deeply. "Don't blow through them all at once," Pius said, raising an eyebrow. He continued. "The rest of the stuff was just junk. Got a card deck, an empty peanut jar, some wiener balloons, a sheet music page, and…this big thing of rainbow glitter." He tossed each item on the ground as he said their names. Eugene shuffled through all the trinkets Pius had brought back. "There's a note tied to the glitter bag," Eugene noticed a tiny roll of paper attached with a neat red ribbon. He slid it through the bow and unrolled it. He gave a puzzled look as he saw what it said. Go to hell, Charley, this isn't funny anymore. We hope you get Inflated. Eugene looked up at Pius and handed him the message. "Um, by any chance, were there still…"
"Another pair, starved by looks of it," Pius said solemnly, still eyeing the paper. "Poor guys. Looked like they'd been dead for quite awhile. All dried-out, you could see their faces through the receiver." Eugene shifted slightly at the thought of two different, mummified Clowns sprawled on top of a dial wheel. Things were silent for a few moments. "Get some rest, Pius, we gotta get out of here." Eugene shimmered and turned into a prairie dog. He began to burrow underneath the dirt to make a resting spot. "I would have thought you'd have had it with tunneling rodents by now," Pius said. "Hey, if I can keep the light out, it's fine by me," Eugene's muffled voice came out of the hole he had just dug. Pius sighed and turned into an umbrella bird. The parasol kept him cool and comfortable. "Looking pretty shady there, Pius," Eugene said, peeking his eyes out. "Good night, Eugene," Pius squawked. Eugene awoke back on the Chopping Table, and promptly was seized by a wave a terror even stronger than the first time he had been here. He looked up at the swirling roulette wheel above him, a device that was supposed to lull and anesthetize Clowns before they underwent Circus-time procedures. "NO!" Eugene shouted. "NO! NO! NO! NO! NO! NO! NO! NO! NO! NO!" Around him, surgical "clowns" were preparing all the tools and machinery in order to make sure Eugene was fit for Circus Life. In other words, they were going to shut down a good deal of his mind and body to suppress the violence and temper most unaltered Clowns were prone to. One of the medical clowns began moving towards Eugene, standing over him as if to reassure that the procedure would go smoothly. The sixteen eyes staring at him, and the long dexterous hands wielding scalpels didn't exactly calm Eugene down, though. "We're about to put you under, Eugene," the clown told him. "When you wake up, you'll be ready to go off to the Circus. Try to relax now." Eugene hyperventilated and began to yank on the straps holding him down. "Not again, not again, not again." His voice was shaking with fear. "It will be alright, Eugene," the doctor said, as he put a pair of goggles over Eugene's eyes. He turned toward the other clowns. "Is the wheel ready to go?" "Yes, Darius." a female clown flicked a few switches, and the roulette wheel above Eugene began to turn and glow, faster than before. "Let's begin the operation," the doctor said, gas masks sprouting onto everyone's face except Eugene's as mist began to spray from nozzles in the center of the rotating disc. All the gases, twirled around, forming a twisting rainbow string that shot straight into Eugene's nose, and knocking him out in an instant. A moment later, at least to him, Eugene's eyes snapped open to find a dozen blades inside him, his torso cut open. As two of Eugene's eyes shot out and punched holes through the dirt, a third eye looked around and saw a tiny flip phone biting into his behind. The little red thing formed a mouth with the two hinged parts, and they were full of teeth. "Get the hell off me!" Eugene screamed, rocketing out of his hole (and knocking Pius, still an umbrella bird, off his feet), turning back into a Clown, and ripping the tiny phone off his buttocks. He chucked it as hard as he could, and it landed a good thirty meters away, where it thrashed and chirped in high-pitched, warbled noise, like a crazed dialing tone. "Eugene, what happened?" Pius said, now back as a Clown with a slightly bent umbrella for a left hand. But Eugene was already making a dash for the tiny cell phone, with murderous intent in his eyes. Pius got there first. He yanked Eugene by the collar and brought them both to a screeching halt. "Pius, MOVE, I'm gonna stomp that thing to fragments!" Eugene choked, his eyes literally burning as flames shot out of his mouth. "Not happening, Eugene," Pius said calmly. With that, he turned his hand into that of a polar bear's, and gave Eugene a good dose of head freeze. The fevered Lesser Clown slumped, quite literally, out cold. With Eugene temporarily out of the equation, Pius looked down at his partner's antagonist, which was still flopping pathetically on the ground making electronic wailing. Suddenly, it melted into something similar to a black, pudding-filled water balloon, and started tumbling away. "What the—oh, no, you're not leaving just yet, little guy." Pius ran after it and snatched it up in the peanut jar he had found earlier. He brought the clear plastic container up to his eyes to get a closer look. The tiny phone was gnashing wildly. "This thing is… a baby Fun-Lover…how?…." Pius looked towards Eugene, who was still out cold, then looked back at the little creature. Wra, wra, wra, wraaaa, wraaaa, wraaaa, wra, wra, wra!!! the juvenile critter made a vicious snap at Pius' nose, whose owner quickly withdrew; the plastic cracked slightly from the impact of the bite. "Bad Fun-Lover," Pius scolded, giving the jar a rattle, which sent the cell phone bouncing around the interior with an audible clatter, clatter, clatter. Wra, wra, wra, wraaaa, wraaaa, wraaaa, wra, wra, wra!!! The wailing grew louder. Eugene shook his head and clasped his hands over his ears at the incessant screeching. He leaped to his feet as soon as his thoughts were clear and looked around wildly, one of his hands moving to shield his stomach. "Eugene, calm down!" Pius ordered as his partner's eyes were clouded by fear of a terrible memory. "Calm, down, you're in the Hub, with me! It's Pius, remember?" "Don't cut me open!" Eugene shouted. Oh, Freakin' hell, he's back on the chopping table. Pius' gut suddenly filled with dread. "Eugene, you're fine! You're fine, okay! Everything is fine!" "DON'T CUT ME OPEN!" Eugene screamed. "I'm not, I'm not!" Pius shouted. The air was rapidly becoming laden with noise, and a ringing was filling his ear with the combined cacophonies. Wra, wra, wra, wraaaa, wraaaa, wraaaa, wra, wra, wra!!! "SHUT UP!" Pius bellowed, swinging the Fun-Lover into the ground like a whip; the peanut jar, along with the phone cracked and shattered, and the toothed calling device ceased all movement. Pius walked over to Eugene, grabbing him and looking him in the eye. "Look at me, come on Eugene, look at me!" Pius said firmly. "Pull yourself together." Eugene's hands turned into talons and raked Pius' calf. Pius grimaced but held on. "Okay, buddy, hang on here." He pulled a purple Clown pill and forced it into Eugene's mouth, before clamping his jaw shut. The effect was immediate. Eugene's eyes lost their fever and he lost all tension as lavender spots popped up all around his skin. His breathing slowed, trying to bring his heart rate down. After a few moments, he spoke. His friend was at a distance, nursing their clawed leg. Eugene stepped forward. Pius held his hand up. "Back," he panted. "It's fine." Pius winced as his wounds were still oozing out black blood. "I'm fine. A little Clown Milk and I'll heal right up." "What— what bit me?" Eugene asked quietly. "Baby Fun-Lover. Nasty little thing too, I might add." Pius said, still hobbling, but gesturing towards the lifeless cell phone on the ground. Eugene went over to it and knelt down. "A Fun-Lover? But I thought that—"
Eugene leaped back as a hulking red rectangle crashed in front of him, throwing up a spray of dust. Loud, beeping emanated from the center of it, sounding similar to frantic, garbled radio chatter. As the dirt settled again, Eugene saw that he was staring at an enormous, scarlet box phone. Two large ebony bells at its top stared at Eugene, then down at the tiny flip phone. It began shaking violently, then let out an ear-splitting blast of static noise.